Physical Description: Shown in picture. Mental Description: Shinbou has been abused both physically and mentally from a young age in order to turn her into a pit fighter creating a mental switch in the girl. In her relaxed state Shinbou is quite and withdrawn preferring to follow others orders and rarely voicing her own opinions. In her trained aggressive state which switches Shinbou over to a more bestial feral fighting mode.These states are not separate identities and instead are is a representation of the techniques used on Shinbou to force her to perform in desired ways using the right stimuli. Shinbou is also very dependant on positive interactions with people using friends and family as means to keep her grounded and to help curb her more aggressive tendencies. The two states of Shinbou have been trained into her by using her eyes in order for the slavers to easily determine when she is in her safe state. When Shinbou is calm she keeps only her blue eye open but when she becomes aggressive her amber eye opens and the blue closes. History: Born in a village in extreme disrepair within the Marsh Country Shinbou was born into a world of cruelness as her parents were slave stock in order to breed trained slaves that get sold all over the country from servers to bodyguards to less savoury things. Due to this Shinbou never met her parents as she was taken from them immediately and given to a tired old matronly slave to be looked after until she was at the age to be trained. Despite her gender Shinbou was saved from the cruel fate that happened to other girls within the slave trade simple because she came from Kaguya stock which were usually ear marked to be trained as pit fighters despite what gender they were since there bodies were strong enough that more brutal training and breaking techniques could be used without killing the slave. 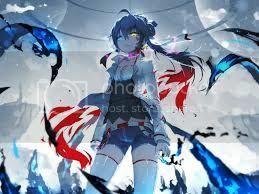 From the age of three Shinbou was conditioned to attack on command using chains and collars as a control mechanism and due to her heterochromatic eyes Shinbou has been heavily trained to have her blue eye open as her safe mode and only to open the amber eye when she was given her attack command. This went on for years and thanks to Shinbou' s genetic traits she was able to kill any fellow slave or child sent against her leaving her riddled with scars across her torso, arms and legs. It wasn't until she was 9 that anything changed for the little girl. The slavers began getting greedy and abducted people outside the country almost indiscriminately until a minor nobles daughter was taken from the land of fire. It didn't take long for the leaf ninjas to receive a mission to remove these slavers and recover the nobles daughter and despite their man power the fools were wiped out in a single night by trained ninja and that's when Shinbou was found sitting in a small area surrounded by the dead bodies of slaves and animals alike. Shinbou was taken back as a survivor and put into a rehabilitation plan which ultimately failed due to her knowing nothing but slavery leaving her in a deeply dependant state. Now she moves is moved from orphanage to orphanage sometimes being placed in other facilities until the village can find someone to take care of the girl and direct her to be more useful but due to her natural fighting ability she was placed into the shinobi academy in order to make some use of the girl. Last edited by Kaguya Shinbou on Fri Aug 03, 2018 7:35 pm, edited 3 times in total. Greetings, thank you for your interest in joining the Leaf Village! Unfortunately, Water Country is under the jurisdiction of the plot team at the moment as it frozen over due to events of the past! Meaning that it would have to swing through their particular department of expertise for review. Secondly, while your alter is claimed to not be a direct Split Personality, the 'blood thirsty to the point of euphoric' is a bit problematic and goes into the grey area of what may be one. Overall, Leaf Council feels the personality may be problematic to various degrees. For this reason, we are denying your application, but please do feel free to edit around to your liking for another review! I don't mind going through review and I changed the personality section a little. Unfortunately with the age of your character versus the Freezing of Mist, Located Here, the timeline wouldn't match up. With that in mind, we are unable to process the character creation. This isn't to dis sway you in the slightest, mind you! Your particular backstory of slave trading is going to be difficult to be approved in most regions outside of Hi no Kuni (Fire Country). I am afraid, even if disbanded, Leaf intervention may be odd to most Councils! If you are alright with such, I personally recommend 'The Outskirts of Fire Country', since you stated it was disbanded then an operation further from Konoha while within the country seems plausible! Edit: Taking to Cloud Council for potential usage of Lightning Country. We as Cloud Council do not find the application to be appropriate based upon our history, our laws or our close ties with Konoha especially (Plasma Accords). There's no feesible way that various powers within the Lightning Country wouldn't have interceded and saved said child from the fate that she was subject to growing up. In our denial, one of the Council members has come up with some possible solutions and we as a council back them up. See below . . . Sounds suspiciously the same right? But still well within the corrupt nobilities' rights. I'm even willing to concede on the fact that they might have their own illegal fighting rings kept between themselves and trained the scrappy kids in it. Probably in the guise of making them 'guards' (This can still be the abusive, bloody situation they want. No one's going to bat an eye if a kid died to a training accident) The nobility might have even pinned down a few of the family lines in their villages who seemed to still produce children with chakra. Since Kumo will pay for those kids, they'd probably grab any they thought would be worth it, pay a nominal amount to their parents then reap the rewards when Kumo came calling (This is usually every 3-4 years) She could have been too young/missed the first time, and probably would have been noticed the next time. As for why she would end up in Leaf? Maybe the nobles son decides he liked the look of a noble's daughter and didn't like when she said no so he took matters into his own hands? Maybe there was an illegal international fight hosted in Fire for unscrupulous sorts to parallel Tea's world tournament hype that they brought her for the kiddy ring. Whatever would draw not so nice people over the border and Leaf would dislike enough to put a stop to. Their original history can basically have happened in Marsh without any problems. There is some slavery there at this point I think, the country is pretty broken and has lawless sections, and trying to steal from Fire/getting punted for it isn't unlike them. Cloud Council is presenting the second Alternative with a mere change to Marsh Country (One that they control) without any additional changes being required. All in all, your choice! Marsh Country it is then lol. Sorry for the problems. No worries, apologies on the delay on the ordeal and thank you for your patience! Please post a request for a Genin HERE. If needed please request a Name Change HERE to make your account name match your character name. Starting Yen has been given, and Leaf Access has been granted!